The Holy Hierarch John Maximovitch was born in the Kharkov region in 1896, and reposed in Seattle in 1966. In 1921, during the Russian Civil War, his family fled to Belgrade, joining the ranks of Russian exiles in Serbia, where he later became a monk and was ordained priest. In 1934 he was made Bishop of Shanghai, where he served until the Communists came to power. Thereafter he ministered in Europe, serving as Bishop first in Paris then in Brussels, until he became Archbishop of San Francisco in 1962. Throughout his life he was revered as a strict ascetic, a devoted man of prayer, and a truly wondrous unmercenary healer of all manner of afflictions and woes. He served the Divine Liturgy daily, slept little more than an hour a day, and kept a strict fast until the evening. It is doubtful that any one man gave so much protection and comfort as he to the Russian Orthodox people in exile after the Revolution of 1917; he was an unwearying and watchful shepherd of his sheep in China, the Philippines, Europe, and America. Through his missionary labors he also brought into the Church many who had not been "of this fold." Since his repose in 1966, he has been especially glorified by God through signs and miracles, and his body has remained incorrupt. To thee, the pastor and protector of a countless host * of homeless orphans, widows, paupers, and afflicted souls, * do we offer anthems born of love and thanksgiving. * As a hierarch filled with grace and zeal for piety, * do thou save us from the foes of apostolic truth, * for we cry to thee: * Rejoice, O great wonderworker John. 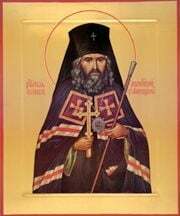 Share the feast of John Maximovitch, Archbishop of Shanghai and San Francisco with an icon greeting ecard.